Recipe for Pasta Bolognese Bolognese sauce is a meat-based red sauce originating in the Bologna region of Italy. This rich sauce is perfectly paired with broad, flat styles of pasta, and the slow cooking process creates a hearty, deep flavor that can’t be matched by pre-made sauces. Below is a slightly simplified version of this classic staple of Italian cuisine. Ingredient List: 1 Â½ pounds ground beef (substitute Â½ pound of beef for ground veal for a more authentic flavor) 4 tablespoons olive oil 1 medium onion, chopped 1 medium carrot, chopped 1 celery stalk, chopped 5 cloves garlic, minced 1 cup dry red wine 2 cans of whole peeled tomatoes, chopped Â½ cup tomato paste 1 cup beef or chicken broth 2 bay leaves 1 tablespoon dried basil Â½ teaspoon dried oregano Â¼ teaspoon nutmeg Â¼ tablespoon red pepper flakes 1 pound of pasta of choice Cooking Instructions: Begin by heating the olive oil over medium high heat in a Dutch oven or large saucepan until it begins to shimmer. Add the onion, celery, carrot, and garlic. SautÃ© until the vegetables are tender, about 8 minutes. Add the ground beef and cook until it browns, mixing it and breaking it up to ensure even cooking. Next, add the red wine along with all of the herbs, and simmer until the liquid has reduced by about half. When the liquid has reduced, add the tomatoes, tomato paste, and broth. Bring the sauce to a slow rolling boil and cover. Let it simmer for at least 45 minutes. For a richer, deeper flavor, reduce the heat slightly and let the sauce simmer for up to three hours. The last twenty minutes of simmering is the perfect time to prepare whichever pasta you have selected. The most common pastas served with Bolognese sauce are tagliatelle, fettuccine, lasagna, rigatoni, or penne. Â When the sauce has finished simmering, salt and pepper to taste, then serve immediately over pasta. Garnish with fresh parsley if desired. 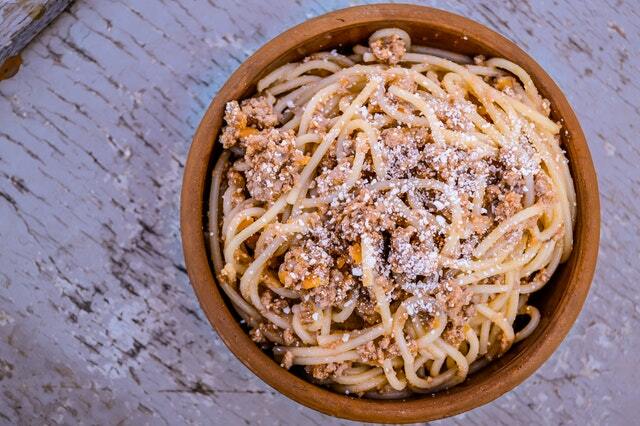 Bolognese sauce is one of the most flexible Italian sauces. There are countless regional varieties and family recipes dating all the way back to the 18th century. As such, there is plenty of room for experimentation. Many people substitute the ground beef for ground pork, or add pancetta to the mix. While the original versions of Bolognese sauce did not include herbs as seasoning, most modern takes on the dish do. For the sake of simplicity, a pre-mixed Italian seasoning can be substituted for the dried herbs without harming the deep flavors this sauce is known for. For a complete dinner, consider pairing this dish with a dry, medium-bodied red wine and a warm side of garlic bread!